You are here: Home ∼ 2017 ∼ July ∼ Felix up the Eiffel Tower then and now. 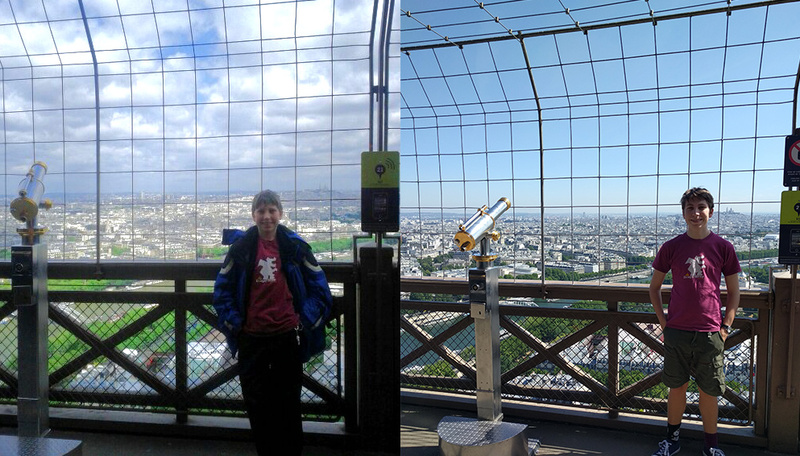 In 2003 Felix went on a school trip and went up the Eiffel tower. He had a word famous DragonDrop Adventure Club T Shirt on. Earlier this month, he went off on his own (well, with 3 friends) and re created the shot. He made sure to point out that as well as it being the same t-shirt (washed between), he’s got the same stormtrooper keyring on his belt. 19 years old now and able to leave the country under his own steam.. and come back!